I felt a fire in my veins that devoured me. 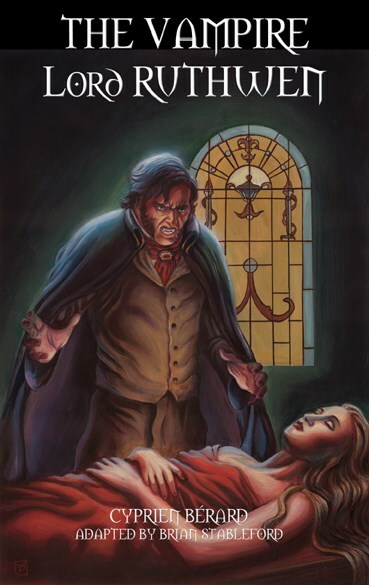 My eyes shone in the profound gloom, my burning lips quivered, the quaking earth opened up, and like terrifying claps of thunder, these terrible words resounded in mid-air: "Vampire woman! Emerge from the tomb!" Cyprien Bérard's The Vampire Lord Ruthwen (1820) was the first sequel to continue John-William Polidori's 1819 ground-breaking story that had introduced the character of the handsome, but evil Vampire lord. Also drawing upon The Thousand and One Nights for inspiration, Bérard weaves stories of mystical Venice, Arabian Nights and Vampire legends into one exotic and suspenseful tale of revenge against the Undead. "A significant stepping-stone in the evolution of the modern image of the vampire, foreshadowing the other major thread of subsequent vampire fiction: the seductive female vampire." Brian Stableford. - Lord Ruthwen ou Les Vampires (Lord Ruthwen; or The Vampires) (1820) by Cyprien Bérard.